Well, I'm almost there now. My induction is booked in for tomorrow. All I have to do is call the Labour Ward at 6.30am to double check they have a bed for me, then its all systems "go"! Me and hubby spent this morning in the Maternity Day Assessment Unit having my final checks to make sure that we could go ahead with the induction. All went well, luckily. My bags are packed, childcare has been arranged for our toddler and everybody knows their role. The only thing missing is my mum, but as she is on the other side of the world enjoying a truly once-in-a-lifetime holiday in Australia and Hong Kong, I shall have to do without her. BTW, Happy Birthday Mum! 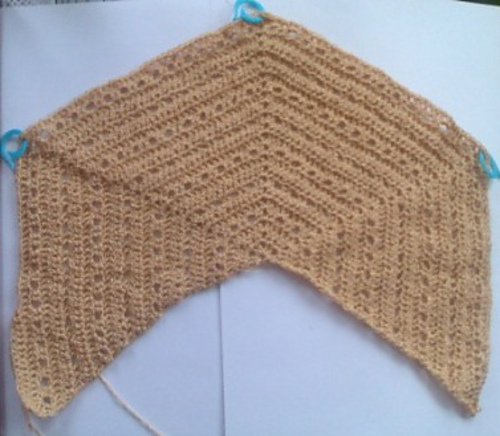 My breastfeeding shawl is coming along slowly but steadily. I think I might have a few spare moments tomorrow to work on it, while we wait for the induction process to do its thing. As an estimate, I think I am about 15% through it at this point. Its difficult to calculate as each row gets progressively more stitches and I'm still unsure as to exactly what the finished size will be.